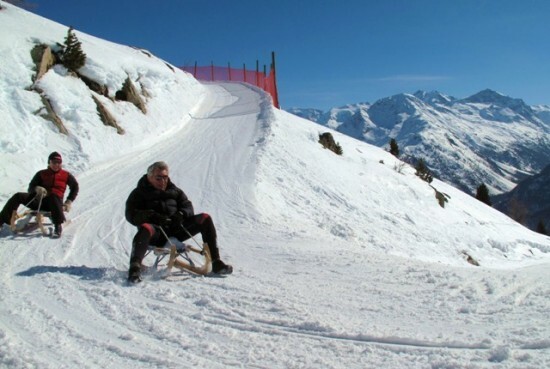 We spent our pre-race rest day expanding our recreational horizons, testing wax, and setting the World Land Speed record on the sledding hill in St Moritz. No time for words, so I leave you with a story in photos. 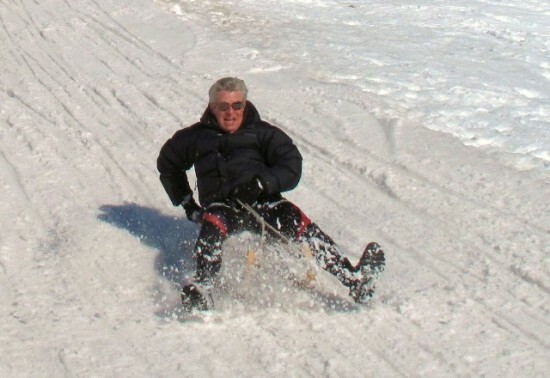 . .
My secret to a fast sled! Kuz, Jim, Aga, and Don. CXC Varsity Sled Team. Interested? Sign up here. Every Worldloppet has some sort of sprint event with big crowds and big prize money. 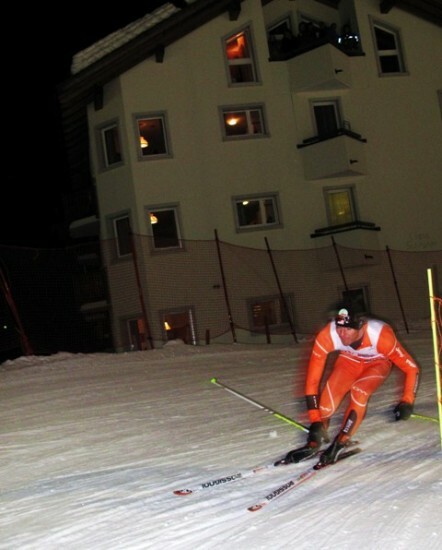 Last night, the village of Sils Maria hosted the Engadin Night Sprints: knock-out rounds of racers on an icy, fast sprint course under the lights. This year’s event featured the likes of Olympic Gold Medalists Bjorn Lind and Christian Zorzi, World Champion Martin Koukal, and Birkie Champion Fabio Santus. 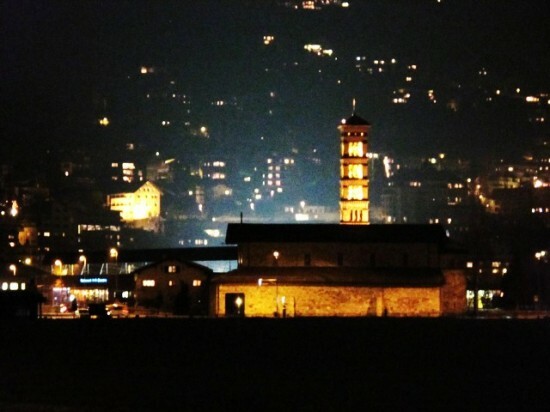 St Moitz by night or by day, both are pretty darn cool! 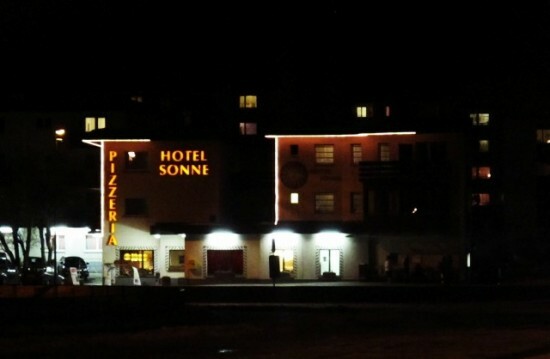 The Hotel Sonne has been our home away from home this week. A big thanks to Gus for finding a booking us the best hotel in town. There’s no Rolls Royce to pick us up from the airport like some other hotels in town, but we can walk anywhere we want, including 200m to the ski trail. One of the highlights of the night sprints was seeing so many familiar faces. 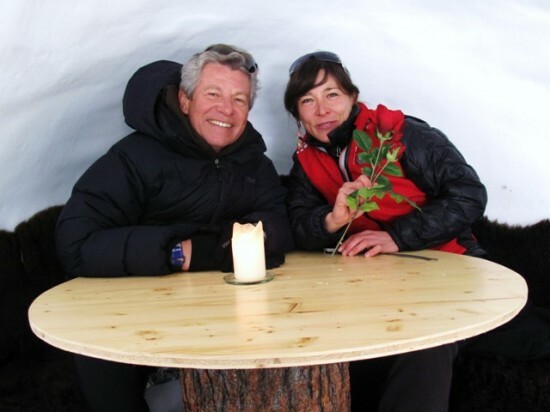 Here, Don catches up with former US SuperTour Champions Martina Strusova from Czech and Karin Caminsich from Switzerland. The food and drinks at the Night Sprints can’t be beat. 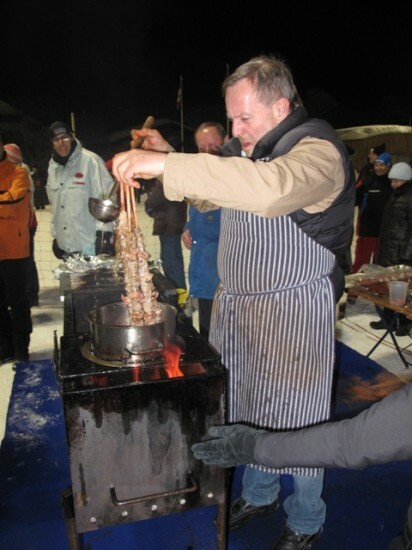 Gluhwein from an ice bar is obligatory to wash down a classic Swiss rindkabob. 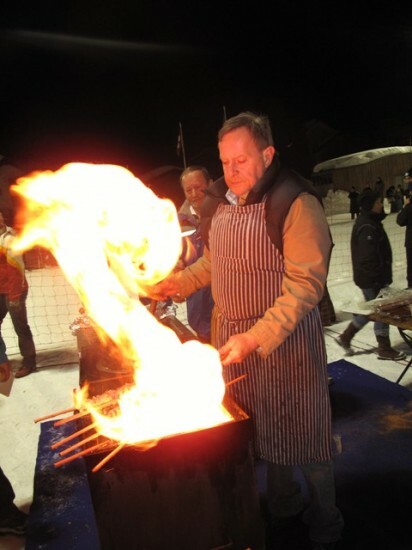 Here, Beat pours hot oil onto the kabob before lighting it on fire! Oh yeah, there were some ski races too. Torin Koos ended up getting taken out on a corner in the Semi’s, but put in a valiant effort none-the-less. Here, the Midwest crew of Jim Michler, Adam Swank, Tyler Kjorstad, Kuz, Paul Belknap, Aga Bednarz, and Don Becker get together for a group shot to cap off an exciting evening of racing and food. 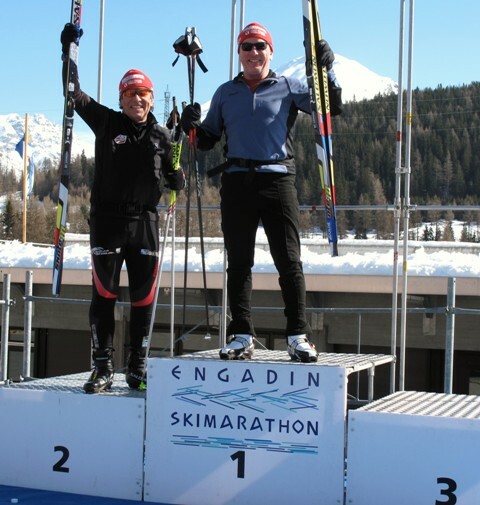 Engadin Marathon starts at 8:20 tomorrow morning! Stay tuned for the full race report. 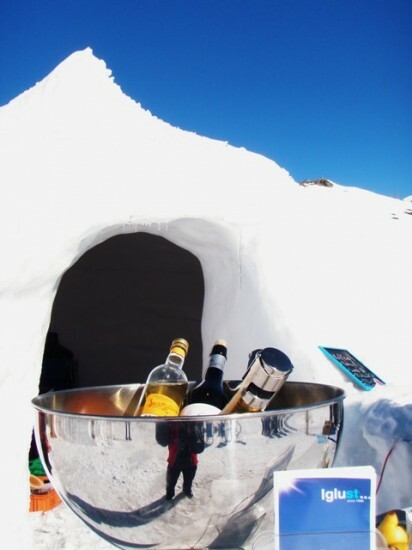 . .
Another ideal day in St Moritz. Course inspection is complete having skied each half of the race course the past two days. The course is groomed impeccably, start to finish and we still haven’t seen a single cloud. Unfortunately, the forecast is calling for 2 to 5 inches of fresh snow the night before the race which could make waxing a little tricky. 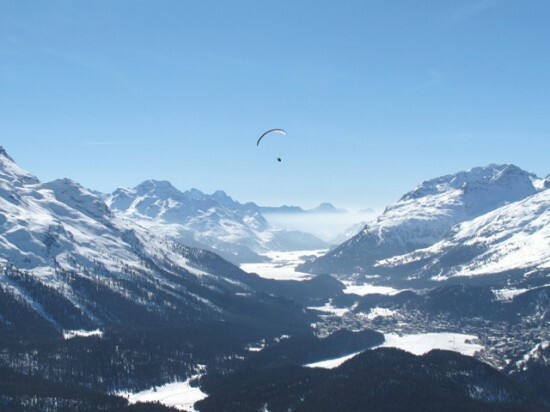 We’ve run into quite a few of the 84 total Americans competing in the Engadin this year. So far, everyone has asked what the best wax will be. Given the snow in the forecast and the temps hovering around 32 degrees F, I’ll be waxing with a Toko HF yellow/red 50/50 mix and Jetstream on top of that for a little extra speed. For kick, I’d recommend a thin Toko green binder (not sure how long you’ll be on the course), followed by a 4 – 5 thin layers of Toko red kick wax. If you think you’ll be on course for a while, toss a yellow and silver into your bag to re-wax as the temperature warms throughout the day. The corduroy and tracks are perfect. There’s room to ski at least 10 skiers wide across the lakes during the first 15km of the course! My favorite part of the course, hands-down, is Mattress Hill. 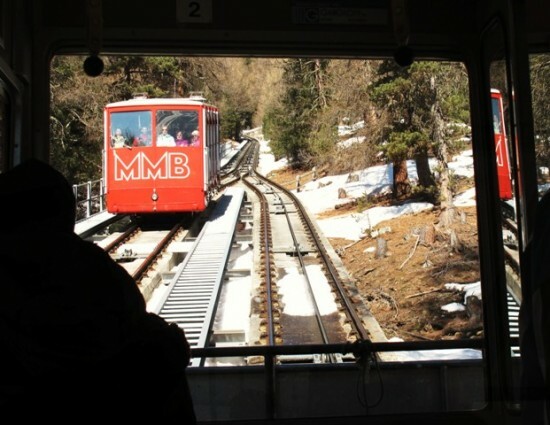 It’s a long, glade style descent through the trees dropping from St Moritz to Pontresina at the 20km mark. The trees are covered with mattresses, but there will surely be some epic collisions during the race! Here’s a little preview. . . 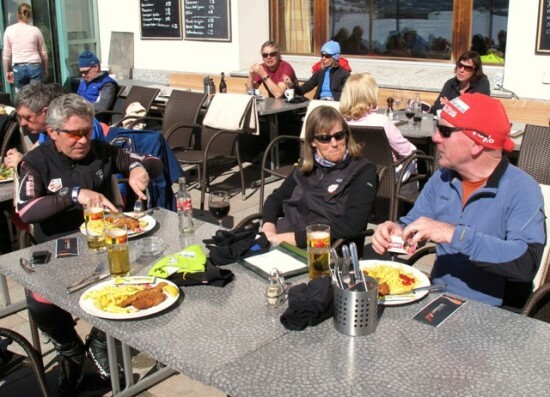 When we’re not skiing, we’re enjoying some great food and company. 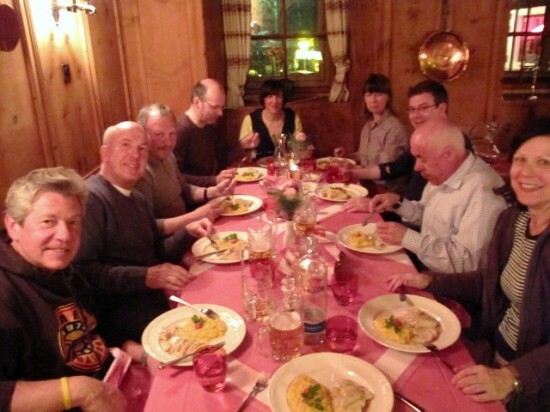 Last night, we joined a group of Don’s friends from Hecklingen, a small town in Germany’s Black Forest. 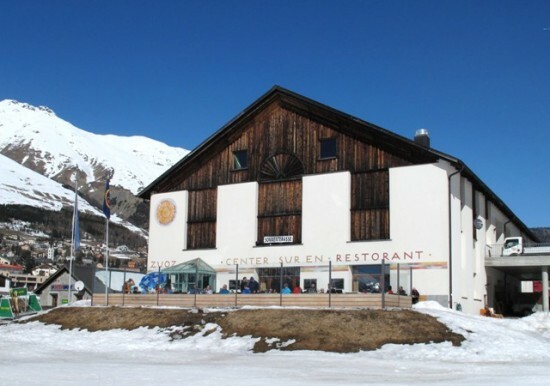 We ate at the Scaletta, a classic Swiss restaurant in the village of S-chanf, located right next door to one of the many homes of Italian Prime Minister Silvio Berlusconi. The Scaletta’s owner, Mario, remembered Don from the last time he stayed there over 5 years ago and was a great host for our dinner. While the whole group spoke great English, I occasionally played the role of translator. I realized how tough translating can be when, at one point, I turned to ask Don and Jim a simple question. They looked back at me blankly and couldn’t answer the question. After a moment of waiting for their response, I realized I’d been speaking to them in German! They haven’t let me forget that one anytime I try to tell a story or ask a question. Aga Bednarz, the fourth (any by far the best looking) member of our crew, arrived last night. 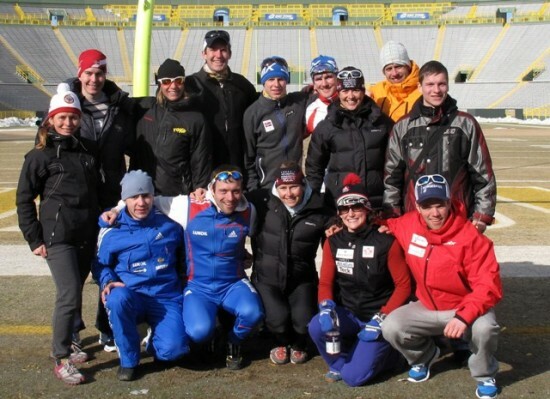 Now we’ve got the whole team in St Moritz and ready for the Engadin on Sunday. We’re taking a rest morning today, getting caught up on the internet and sights. 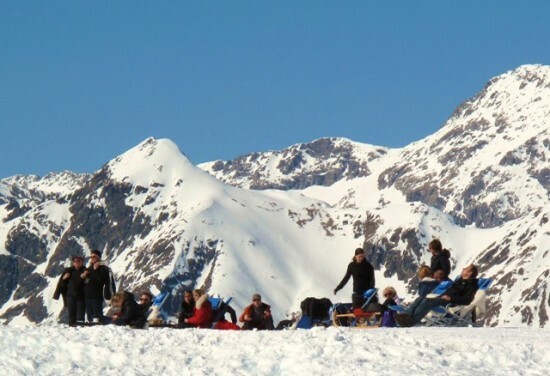 This afternoon, we’re off to Muottas Muragl for some sledding. 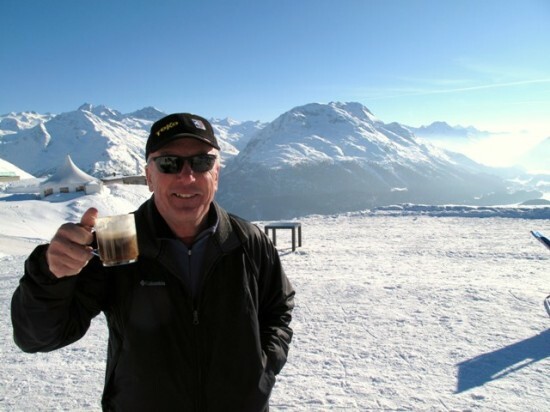 Don’s already trash-talking his ability to set the new land-speed record on the descent! My transition to European time has never been easier than on this trip. Maybe it has something to do with the fact that I haven’t trained in a week and there’s no racing pressure (my gut is still on the mend). Don and Jim think it’s because of the relaxed company. 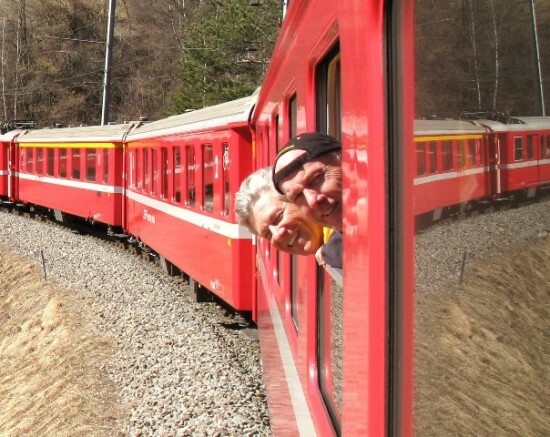 Whatever the case, it was an ideal first day of the trip spent exploring the Engadin valley. Sonne means “Sun” in German and the view this morning from Hotel Sonne was just that. Does it get any better to waking up to a view like this? 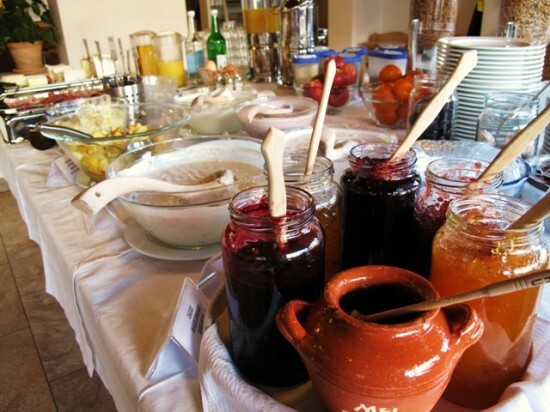 Yeah, actually, walking downstairs and finding a breakfast like this! It wasn’t hard to eat a big breakfast for the day ahead. Some bikers are known to measure their training in “chamois time;” that is, how much time they have spent in their bike shorts. “Boot time” would be a little more appropriate for us today. 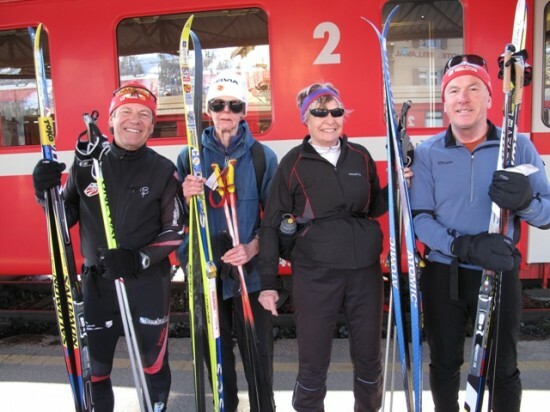 We skied a full 25km from St Moritz to the finish of the Engadin in S-chanf. That’s not bad, but the fact that it took us over 6 hours? Just logging some boot time. 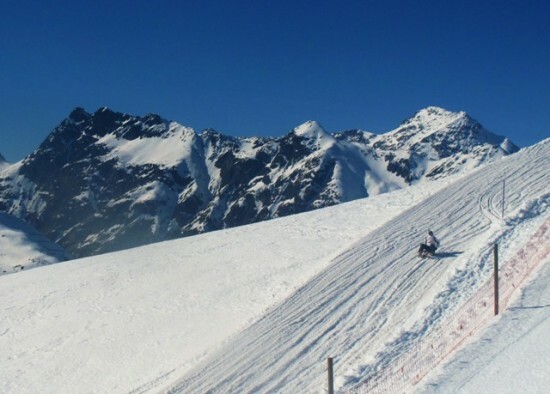 “It’s all downhill from here!” — Don show’s us the course profile for the Engadin. 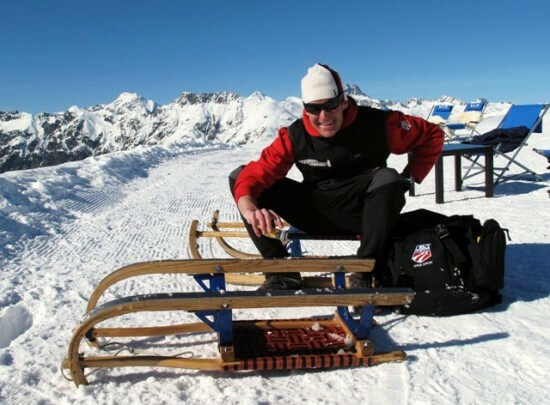 Don Becker is a disability lawyer from Madison and a big enthusiast of cross country skiing. He supports a variety of causes and events from the food bank in Madison, to the Badger Women’s Hockey Team to the Birkie and the CXC Team. 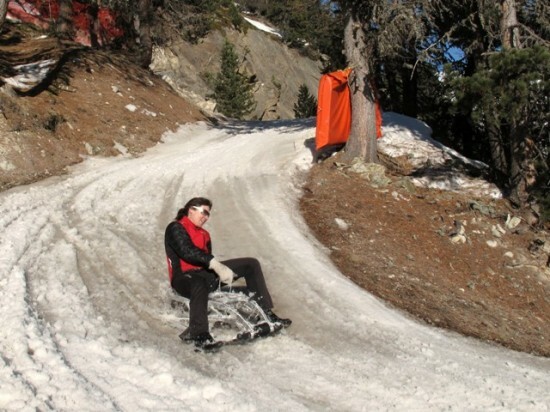 His current project is adaptive skiing, more specifically: getting sit-skis into the hands of as many people as possible. To date, he has helped design, manufacture, and distribute over 250 sit-skis—making cross country skiing more accessible to everyone. 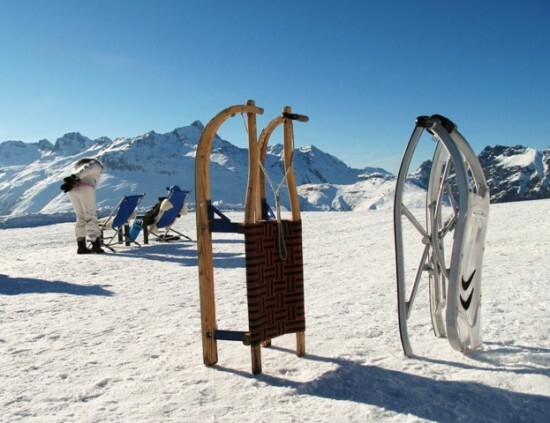 Don’s sit-skis are fully adjustable and can be found for rental free-of-charge at most Nordic ski areas in North America. 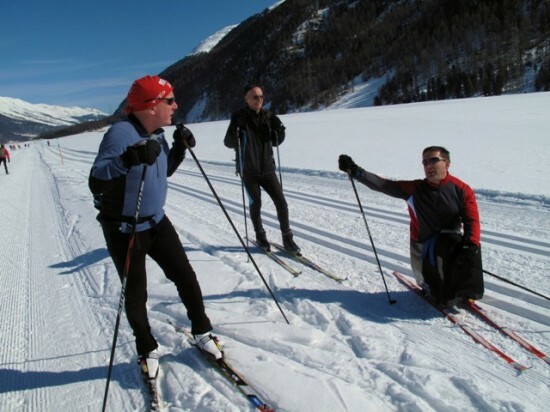 Today, Don met Martin, a sit-skier from here in Switzerland, out on the trail. 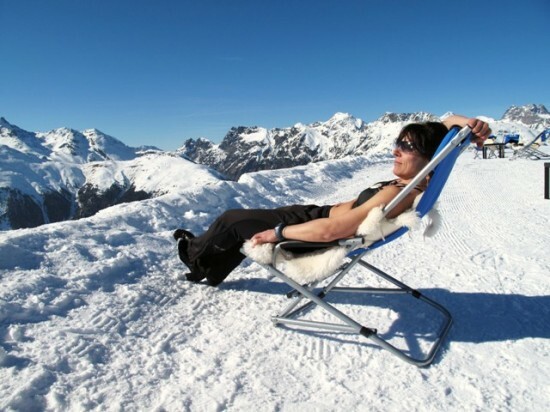 Expect to see a batch of sit-skis coming to Europe soon. . .
Of course, the tracks were fast and bomb-proof. By the time we hit Zuos, we’d worked up quite the appetite and were ready for lunch. The sun terrace at the restaurant in Zuos was exactly what we needed. 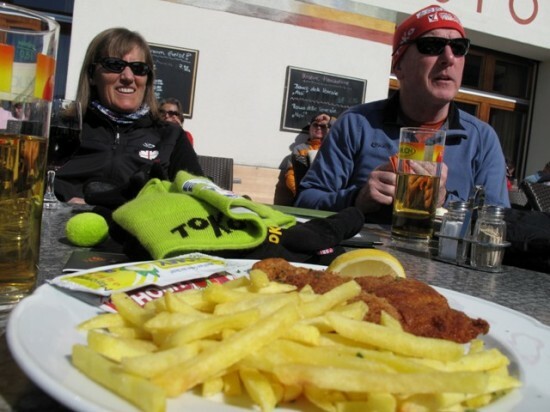 Scnitzel mit Pommefrites and a Rivella helped us recharge for the final 5km to the finish. We were joined by Rose, a Worldloppet skier from England we’d met on the trail earlier. In case anyone forgot, Don reminded us once again today, who is number one. He made the final pass coming into the stadium and used some aggressive rugby tactics to fend off a hard charging Michler. 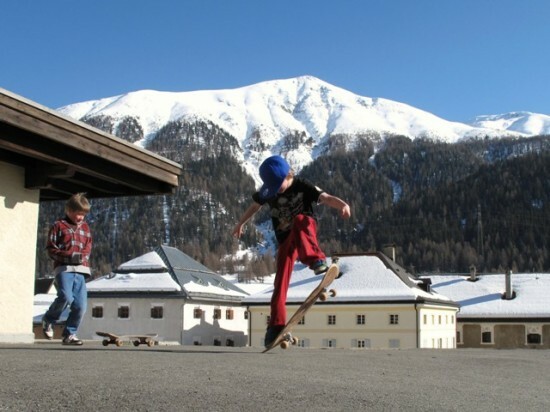 We were entertained by a couple of Swiss skaters while we waited for the train to take us back to our hotel in St Moritz. Did I mention it was t-shirt weather? Hopp Schweiz! Gruesech Miteinan! The jet lag is setting in quickly as I write this, but the St Moritz sun is keeping me awake as it shines through my window surrounded by blue skies and snowy mountains. 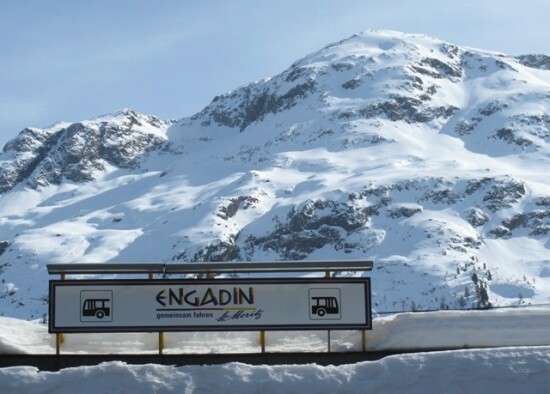 Today is Day One of the CXC Masters Team Engadin trip. 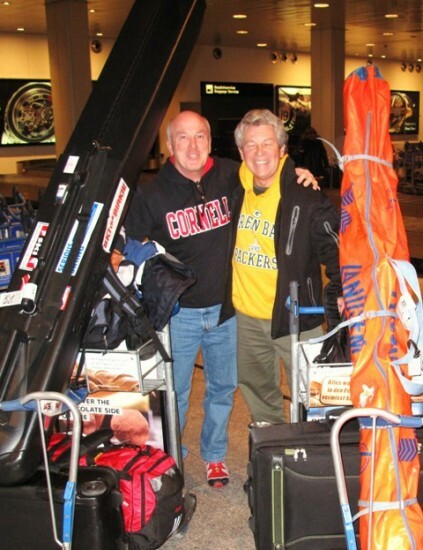 I am joined on the adventure by two of our Masters Team members, Don Becker and Jim Michler. Perhaps, in fact, I am the one joining them. 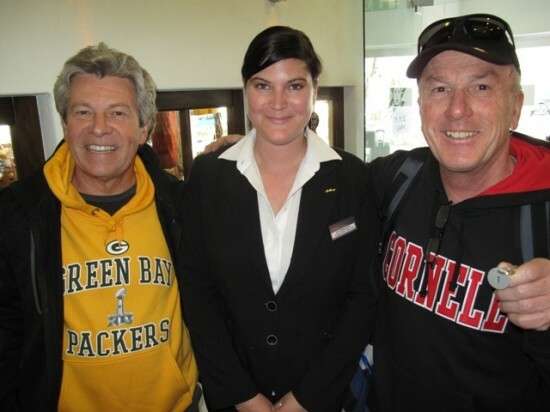 I am slowly nursing myself back to health after a recent appendectomy and have been trying to keep up with Jim and Don ever since we got on the plane to Zurich yesterday afternoon. 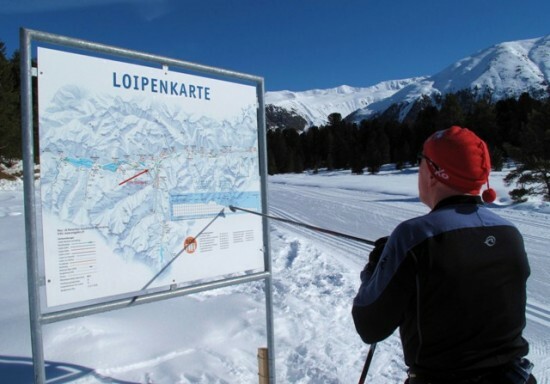 So far, everything has gone according to plan, and in fact, exceeded expectations: skis and luggage are with us, the weather could not be better, and our hotel, Hotel Sonne, is sandwiched right between St Moritz and the Engadin ski trail. Thanks Gus for finding us the sweetest digs in town! Enjoy the photos from Day 1 of our adventure and stay tuned for daily updates of our exploits. 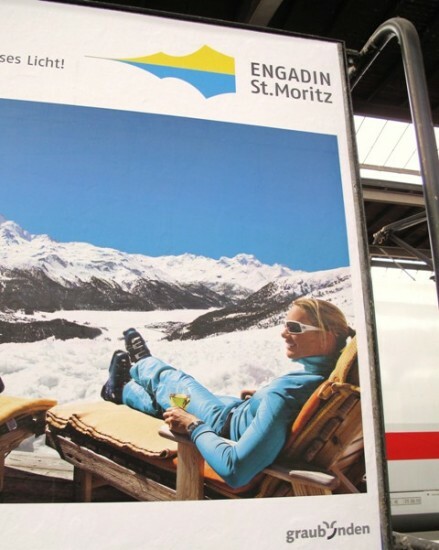 This was the scene promised to us by the propaganda in the Zurich train station. 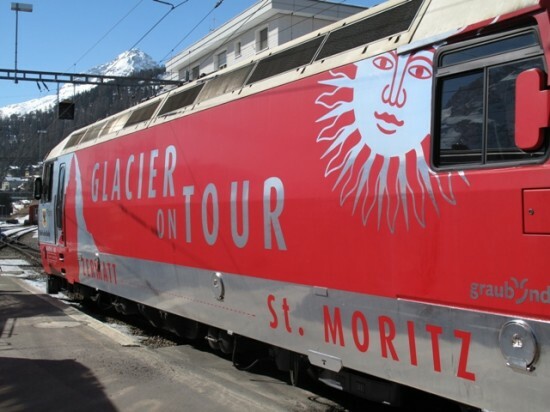 . .
Fortunately, the trip to St Moritz didn’t disappoint! We weren’t the only ones infatuated by the breathtaking scenery. 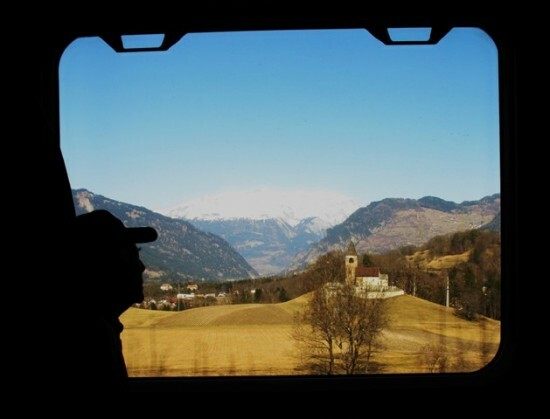 Even the locals could appreciate the beauty of their own country. Usually, when we travel though Europe for ski racing, we travel by van along the Autobahn. 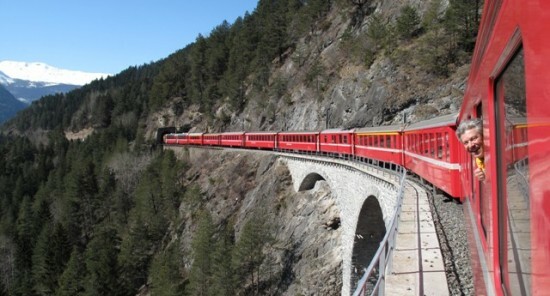 The Rhaetische Bahn from Chur to St Moritz was a welcome change of scenery. Just in case anyone forgot who was Number 1 on this trip, Don reminded us when we checked into our rooms. Room number: 1. Our hostess Samantha made sure everything was dialed. Ski room: check. Wax room: check. Boot drying room, wax benches, iron: check, check, check. Hot tub and sauna. . .we’re still waiting on those. Today’s been a great start to the adventure. The sun has set and it’s time for dinner! Stay tuned for more. . .
Do you get butterflies before big races? Getting nervous before a big event is normal. Some might argue it’s essential. That’s why, when I woke up last Wednesday morning with some good butterflies in my stomach, I knew it was going to be a good weekend. Birkie weekend. Allow me to explain a little about the Birkie. It is the largest Nordic ski race in North America, with a rich history starting at Telemark Resort in Cable, Wisconsin in 1973. The Birkie means a lot of different things to a lot of different people (this year’s 11,000+ total participants made it the biggest year ever). 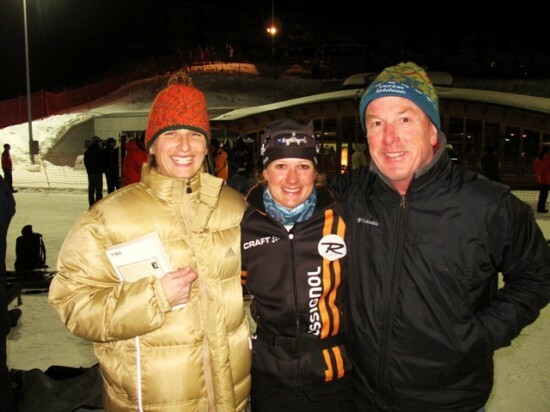 There are Birkie Founders, who have skied every Birkie, Birchleggers who have made the trek between Telemark and Hayward over 20 times, and countless others who have their own unique Birkie stories. The Birkie and I, however, have a very rocky relationship. 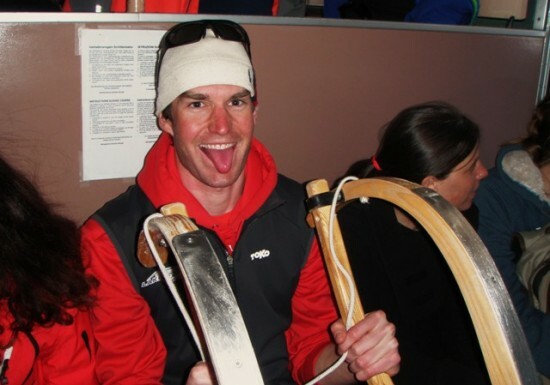 Don’t get me wrong, I’ve got a great relationship with the American Birkebeiner Ski Foundation. They are a significant supporter of my team, CXC Skiing, they are the most significant reason that I moved to Hayward five years ago; I love skiing the trail in the winter, running it in the summer, and biking in the fall, and all the people involved with the organization, from administrators, to groomers, to volunteers, have been huge supporters of my ski career. No, it is with the Birkie – the epic, the myth, the legend – that I don’t see eye-to-eye. As Gerry Hanson reminded me yesterday, my very first Korteloppet in 1998 was cancelled due to a lack of snow. That’s how we got started together. Unimpressed, I missed the following decade’s worth of Birkies for other races: Junior Nationals, the Swiss Engadin, and NCAA Championships. It wasn’t until 2007 when I joined the CXC Team and moved to Hayward that I decided to rekindle the flame. I ran the entirety of the trail, point-to-point, that summer. I logged volunteer hours cleaning it and getting it ready for winter. I skied all my intervals on the trail. Yes, I was ready for the Birkie. 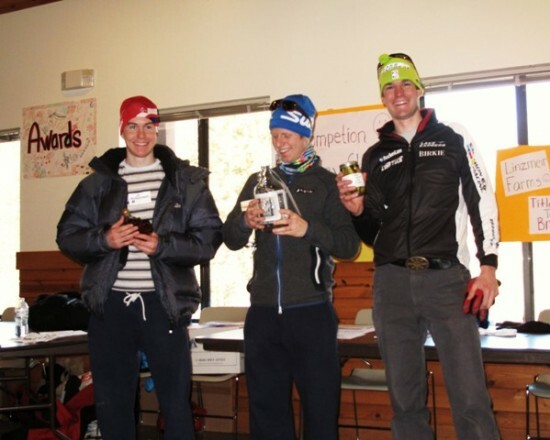 Race week, however, the weather took a turn for the worse and the race was shortened to finish at “OO.” While, technically, I completed the race, it was still not my idea of a Birkie–skiing from Telemark all the way down to Main Street in Hayward. Once again, I missed the next three Birkies to compete in European World Cups, World Championships, and the Olympics. This year, however, was different. I was back in town and ready to ski the race. Training? Solid. Conditions? Phenomenal. Ready? Fired up! Back to Wednesday morning. A healthy dose of butterflies in my stomach when I woke up was a good sign for the weekend ahead. 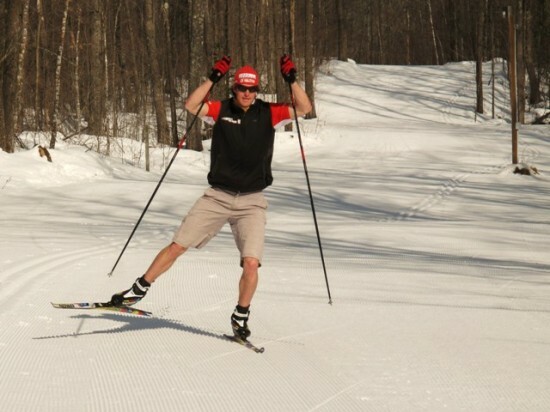 I went for a relaxed ski with my teammate Brian Gregg to get the butterflies flying in formation. Afterwards, my appetite was less than normal and I took a brief nap instead of eating lunch. As the afternoon progressed, the butterflies got worse. 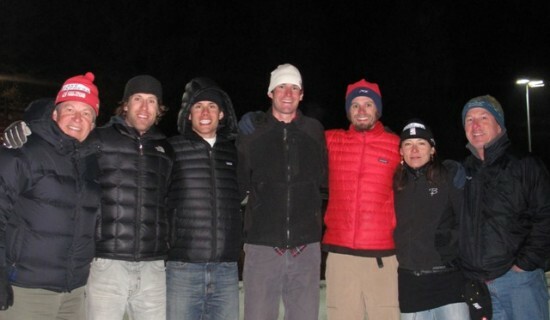 I got an email from Mikey Sinnott saying that several of the skiers staying at Telemark had gotten a stomach bug. Oh no, I thought, I’m going to get the flu three days before the Birkie. At that point, I made sure to stay clear of my roommates, Brian and his wife-to-be, Caitlin Compton, and could stomach only a small bowl of rice for dinner. Wanting to avoid getting sick, I went to bed early and passed out immediately. After what felt like a full night’s sleep, I awoke at 11:30pm. This time, the butterflies had congregated in my right lower abdomen. 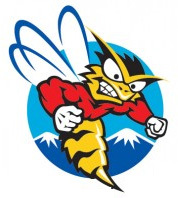 It felt like they’d stung me. Hard. The rest of the night was restless, until the pain became too much for me to even roll over. “Maybe I’m being a pansy,” I thought, “but I need to get to the hospital.” At 5:30am I was on my way to the emergency room. I knew that was the right decision when a deer walked across the road in front of me and I quickly moved my foot from the gas to the brake. Ouch! Possibly the most searing pain I’ve ever felt. Sure enough, the ER nurse diagnosed my symptoms as appendicitis. The ER doctor diagnosed my symptoms as appendicitis. The surgeon, preliminary tests, and CT scan all diagnosed my symptoms as appendicitis. Before I knew it, I was getting knocked out by the anesthetic. The last thing I remember before going under was hearing the nurses laugh when I told them I was still going to be competing in the Birkie on Saturday. . . It just so happens that my nurses were Sarah Krasean, her Mom Martha, and Aunt Susie. 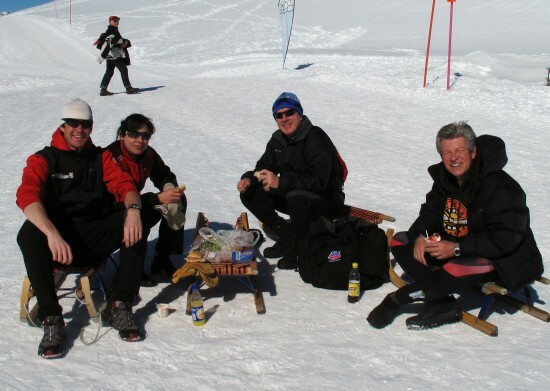 In fact, we’d all been skiing together the week before. Needless to say, they took great care of me. For my first (and hopefully last) visit to the Hayward hospital, I was very impressed. Coach Gus stopped by right after the surgery and entertained me with stories of his appendectomy, Donovan & Chris Dums stopped by and Chris, an ER doc himself, informed me of what would have happened if had I arrived just a few hours later and my appendix had actually burst (at least another week in the hospital, to say the least), then Gregg, Mikey, and Gelso stopped by in the evening and had me laughing so hard I thought my appendix actually was going to burst! I damn near bit my tongue off trying to stop laughing. The visitors and hospital staff were awesome. The food, on the other-hand, was terrible. Remember, I hadn’t eaten in about 36 hours, so I was hungry and could’ve eaten anything. 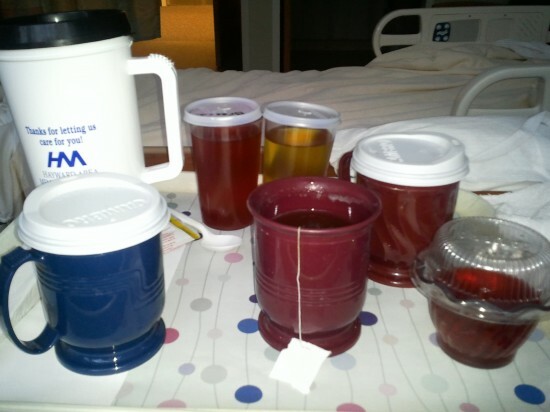 Instead, they kept me on a liquid diet to be sure that everything went okay. My first meal: ice chips, hot water, a packet of dry chicken broth (think Ramen – hold the noodles), apple juice, orange juice, decaf coffee, red jello, and orange sherbet for dessert. It was a disaster. I accidentally poured the dry broth into the decaf coffee instead of the water. Yuck! Then I proceeded to give myself Type II diabetes with all the sugar water they’d given me for “dinner.” Some people may hold McDonald’s and fast food responsible for the diabetes outbreak in the US. From my experience last week, I’d say hospitals aren’t much better and will be writing to both the hospital and the Sawyer County Record to inform them of my opinion. For breakfast, I received my first solid food in 48 hours: a dry cinnamon roll caked with sugar frosting. My departure from the hospital depended on my ability to hold down solid food and that roll was my only option. It was a battle, but I forced it down and was soon on my way home. Albeit s l o w l y. The subsequent days have been good with steady, but again, very slow improvement. I enjoyed watching Saturday’s Birkie on the side of Highway 77 from a folding chair. Seeing my friends and teammates ski by really made me want to be in the race helping with the battle. It was certainly exciting to see Caitlin Compton win the Birkie, Jennie Bender take the Classic Birkie, as well as Karl and Eric rounding out the Classic Podium, and Cook getting into the Top-5 of the men’s race. Congrats to the crew! As for me, I’ve gained an utmost appreciation for the skiers who have been able to successfully race and complete the Birkie year after year. While it won’t be this year, I know that one year, I will be able to tame the Birkie beast and finish skiing down Main Street in Hayward. . . Ski racing has taken me to a lot of places. 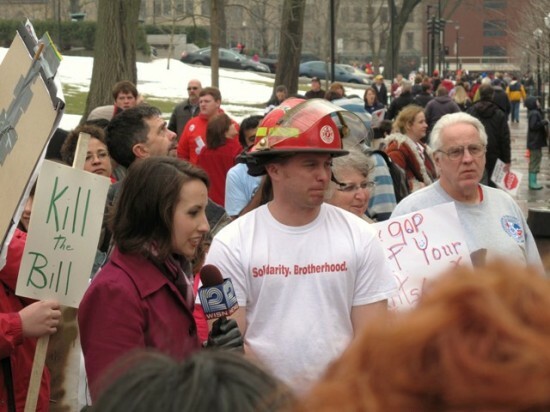 However, it has never taken me to the center of national political and media attention. 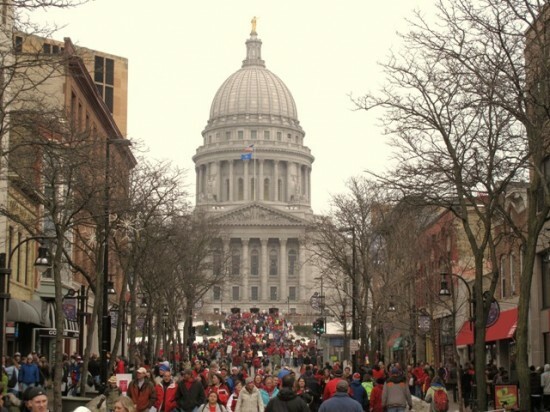 When I was packing for the Madison SuperTour, aka Madison Winter Festival, on Wednesday night, I never would have imagined, even in my wildest dreams, that the next three days would turn out the way they did. 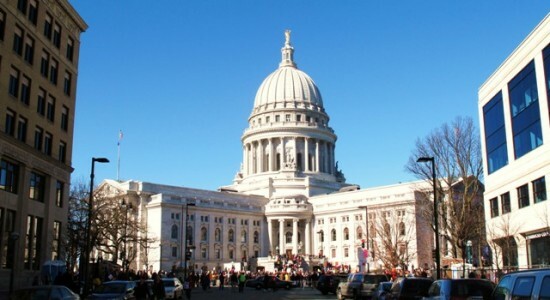 If you’ve been out of touch with the world for the last three days, you can catch up on recent events in Madison here. Cork, Eric, & I left Hayward early Thursday morning. After a couple of weeks in Hayward, we’d been looking forward to getting to Madison for some skiing and culture. 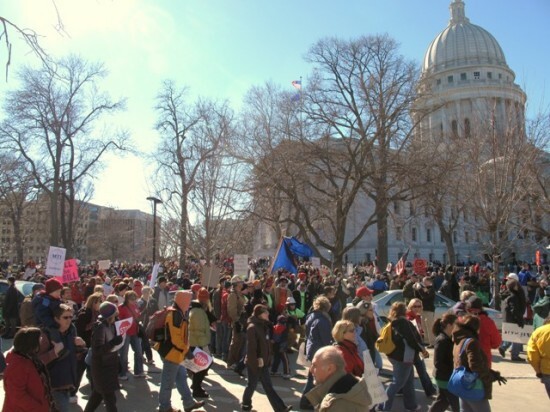 Along the drive, the radio stations were buzzing with reports of protests on the Capitol Square in Madison. “Cool,” we thought, “that’s right where we’re going!” Madtown was living up to its reputation already. 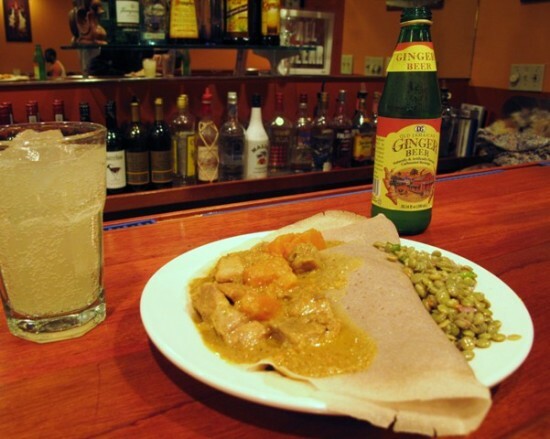 Of course, being on State Street, there’s also some great cuisine and we ate well all weekend, including this curry at Buraka, an East African restaurant in town. Unfortunately, we found out later that evening that the City of Madison pulled Winter Fest’s permit to hold the ski races on Saturday and Sunday. In addition to the protests, the temperatures were above 50 degrees (see next blog post) meaning the area lakes and ski trails were all flooded. Bottom line: no ski racing in Madison. Bummer. In the end, over 60,000 people descended on the Capitol on Friday, including Jesse Jackson. The above shot shows the course we were supposed to be skiing on the next day. Personally, I think they should have held the races. 60,000 spectators and national media attention? 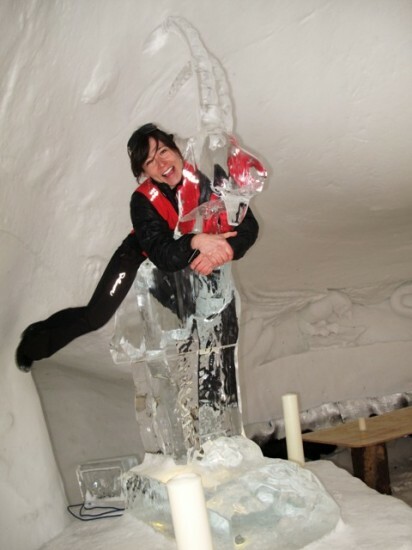 Promoting ski racing doesn’t get much better than that! 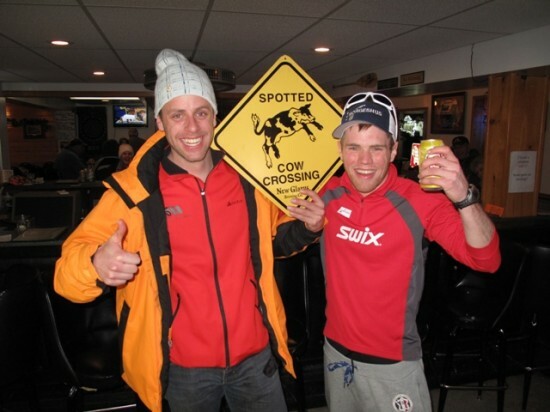 Instead, I traveled to Green Bay on Saturday with the 15 foreign skiers from Switzerland, Russia, and Norway for the annual Stump Farm race packed with gear into the two CXC Team vans. "got any more room in there?" Needless to say, it was likely the strongest international field ever for the local Stump Farm invite. 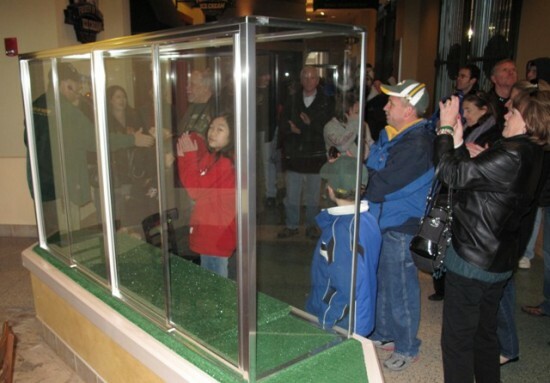 Unfortunately, we missed out on the big SuperTour purse in Madison. Instead, I won a jar of pickles. Some of the most savory pickles I have ever tasted! What was the most unexpected event of the weekend? 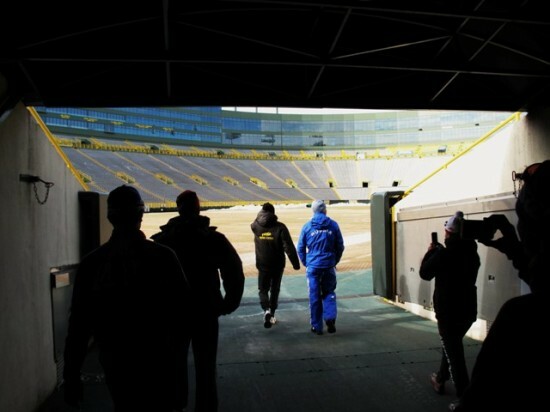 The VIP tour of Lambeau Field of course! 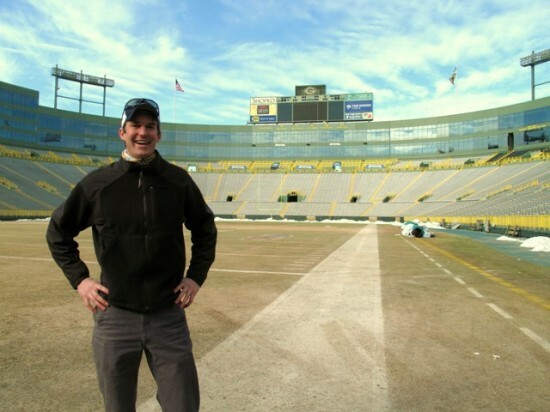 Two weeks after the Packers won the Super Bowl, I was able to walk out onto the hallowed ground of Lambeau Field. It was like a pilgrimage to Mecca. I think I was the only person in the group to have any appreciation for what we were actually doing, but man, it was cool. 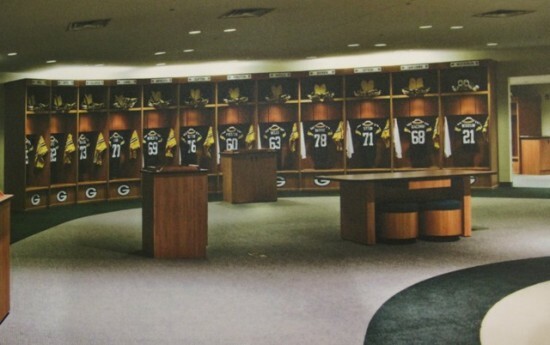 We even got to check out the locker room. 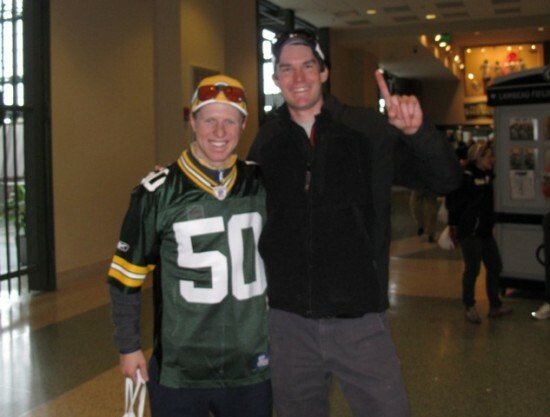 . .
We’ve now got another 15 Packer Backers from the international Packer Nation. Is that Peter Skinstad of Norway or Ryan Grant of Green Bay? I'm not sure. . .
To break up the long drive home, we stopped at a snowmobile bar in Wisconsin for burgers and fries. After an eventful weekend, it was great to be back home in Hayward last night. The Birkie trail was as fast as I’ve ever seen it this morning and I’m looking forward to the big Birkie week ahead. Stay tuned. . .
That’s the current temperature (in degrees Fahrenheit) in Hayward, Wisconsin. Might as well enjoy it while you’ve got it! Just when I thought I’d seen every article, interview, and post-game highlight from the Super Bowl last Sunday, I came across this little nugget from NFL films. If this doesn’t get you fired up, I don’t know what will. 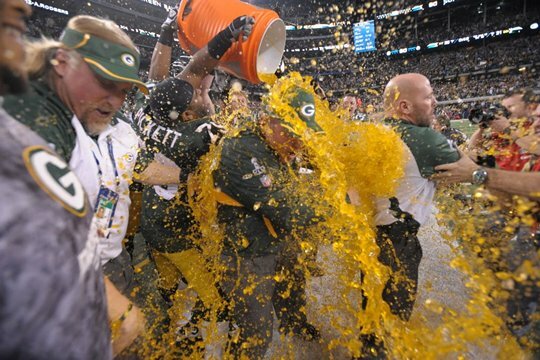 Thanks to Jay Tapper for forwarding this and helping me get my Sunday Football fix, even after the season’s over. White sand beaches? Bonneville salt flats? Nope. 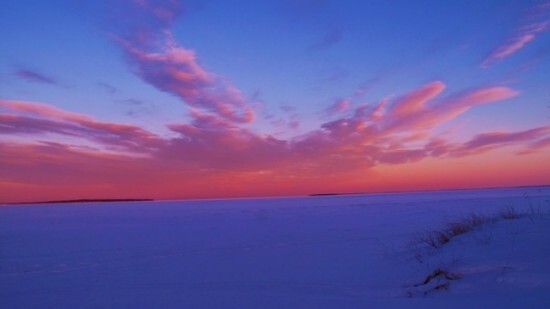 That’s beautiful Chequamegon Bay on Lake Superior at about 15 degrees below zero F. Cold. Skied Mt Ashwabay yesterday with over 25km of narrow classic-only single-track. The trail’s pretty rad and definitely worth checking out!